Hanoi (VNA) – The Committee for Solidarity of Vietnamese Catholics, as a member of the Vietnam Fatherland Front (VFF), will continue to serve as a bridge between religion and secular society, said the committee’s head Tran Xuan Manh. At a meeting with President of the VFF Central Committee Tran Thanh Man in Hanoi on January 22, priest Tran Xuan Manh, who is also Vice President of the VFF Central Committee, affirmed that Committee for Solidarity of Vietnamese Catholics will encourage Catholics to be good citizens under the motto “Good life, good religion”. The priest thanked the VFF Central Committee for its assistance to the Committee for Solidarity of Vietnamese Catholics in organising the 7th congress for the 2018-2023 tenure. 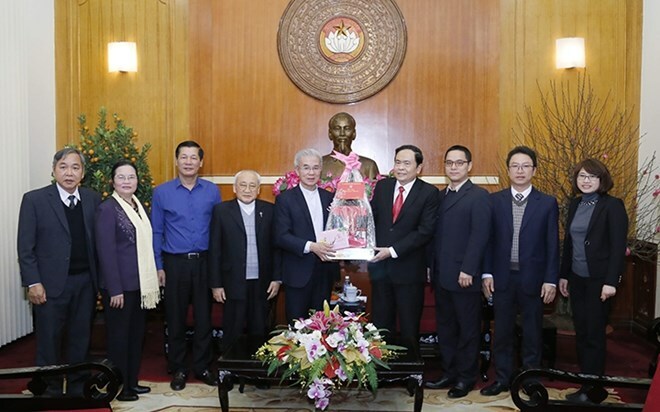 VFF President Tran Thanh Man hailed the success of the 7th Catholic congress, saying that it laid the important foundation for the Committee for Solidarity of Vietnamese Catholics to further develop and successfully implement its plan of actions in the tenure.